Default activation of the spindle assembly checkpoint provides severe constraints on the underlying biochemical activation rates: on one hand, the cell cannot divide before all chromosomes are aligned, but on the other hand, when they are ready, the separation is quite fast, lasting a few minutes. Our purpose is to use these opposed constraints to estimate the associated chemical rates. To analyze the above constraints, we develop a markovian model to describe the dynamics of Cdc20 molecules. 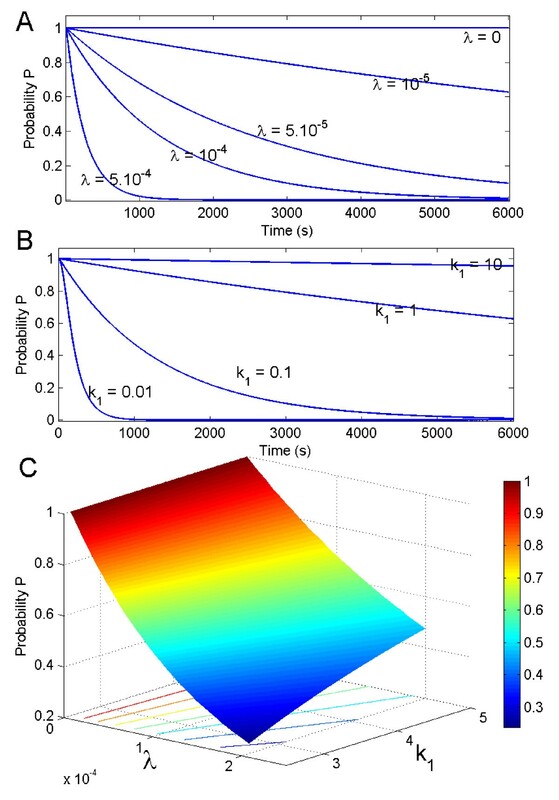 We compute the probability for no APC/C activation before time t, the distribution of Cdc20 at equilibrium and the mean time to complete APC/C activation after all chromosomes are attached. By studying Cdc20 inhibition and the activation time, we obtain a range for the main chemical reaction rates regulating the spindle assembly checkpoint and transition to anaphase. Although the exact mechanisms of the SAC and anaphase processes are still unclear, several key steps have been identified. Sister chromatids are initially bound by proteins such as cohesin. During anaphase onset, separase protein cleaves cohesin, thus allowing the sister chromatids to separate . Usually, separase is prevented from cleaving cohesin through its association with another protein called securin. Securin can be ubiqitylated by the activated Cdc20-anaphase promoting complex/cyclosome (Cdc20-APC/C) at the kinetochores . However, when the kinetochores are not all properly attached, the SAC enables the ubiquitylation and inhibition of Cdc20 binding with APC/C [2, 3]. The mechanisms leading to Cdc20 ubiquitylation involve several proteins such as Mad2, BubR1, Bub3 . Current models [5–10] of the checkpoint propose that Mad2 protein has a crucial role either to sequester Cdc20, or acts in conjunction with the BubR1 and Bub3 proteins to form an inhibitor called the Mitotic Checkpoint Complex (MCC). Mad2 changes conformation to bind Cdc20 tightly via a safety belt mechanism [5, 7, 8], while another inhibitory complex comprised of BubR1 and Bub3 has also been identified [9, 10]. The SAC has been modeled at a molecular level, however the parameters used [11–14] may not necessarily reflect in vivo dynamics . For example, these modelings do not take into account the finite number of binding sites for Cdc20. In addition, the constant flux assumption  made for molecules reaching a kinetochore impacts the APC/C activation, leading to an overestima-tion for the catalytic activity. We shall revisit here some of these major assumptions in the construction of our model. An improvement of these models was recently achieved [16, 17] by taking into account the finite number of binding sites at kinetochores , leading also to an estimate for the MCC chemical rates associated with SAC. In the present article, our purpose is to study the inhibition followed by its fast activation of Cdc20, which is the key activator of the anaphase promoting complex. 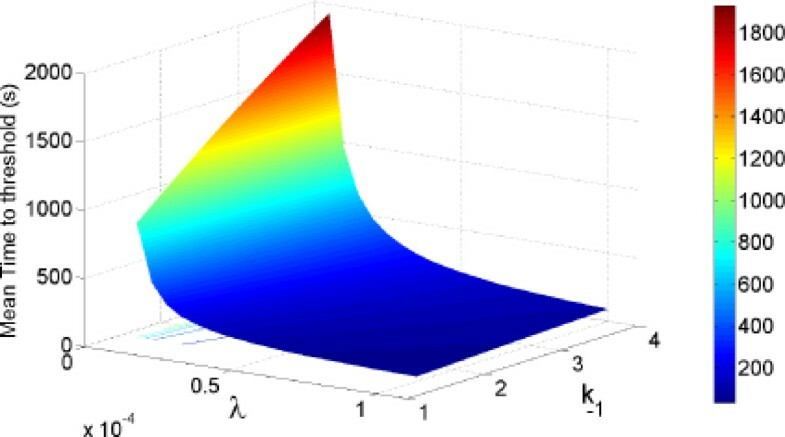 As the number of kinetochores implied in the SAC is small, the forward binding rate of a chemical reaction as it is classically computed in the continuously concentrated limit cannot be applied. To adequately describe chemical reactions in microdomains [18, 19], where targets such as kinetochores have to be reached by the anaphase activators, we use a stochastic approach. Using Markovian equations [18, 20] to account for the binding dynamic associated with a finite number of molecules, we compute the time dependent probability that the spindle is not initiated before time t (formula 23) and then the mean time to induce anaphase (implicit formula 29). We apply our analysis to PTK2 cells and thus, we obtain some quantitative constraints on the Cdc20 production rate and the MCC concentration to guarantee strong inhibition of Cdc20 by the SAC. Using different parameter values (cell size, number of chromosomes...), our method can be extended to other cell types and organisms, providing a general framework to study the dynamics of activators during the spindle checkpoint and the anaphase transition. where [MCC] is the concentration of MCC, uniform over the cell and b is the radius of the Cdc20 binding site. When the SAC starts, no free Cdc20 molecules are present in the cell, thus we choose for the initial conditions pk(0) = δk,0. Because there can only be S Cdc20 molecules, we have for all time t, pk(t) = 0 and k > S.
The probability P for no activation during the SAC is represented as a function of the time and the rates λ and k -1 . A :We plot P(t) as a function of time for different values of λ and k-1 = 1. B: as a function of time for different values of k-1 and λ = 0.1. C: at time t = 1200s as a function of λ and k-1. The parameters are given in table 1. 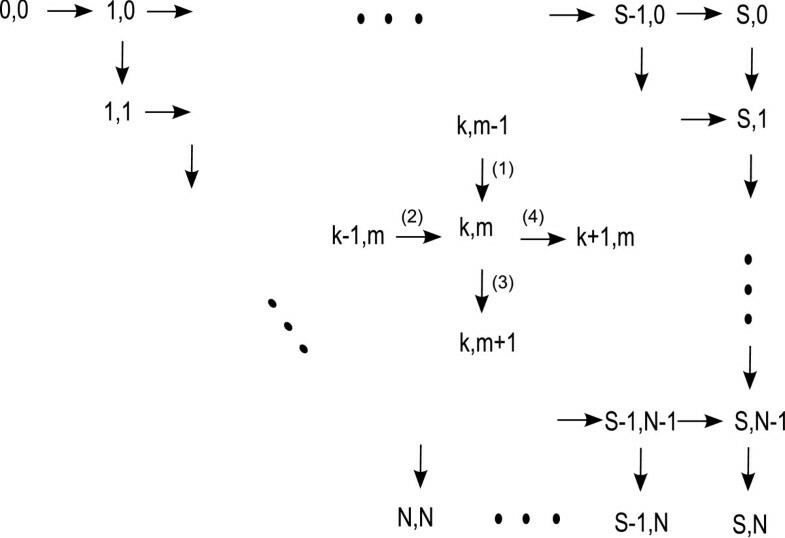 Schematic representation of the Markov Chain associated with the joint probability p k,m ( t ) to have k bounds APC/C and m free Cdc20 molecules. The time τ is plotted as a function of the parameters λ and k -1 . The parameter valuers are given in table 1. For example, fixing the value λS = 0.3, we find that anaphase is triggered after a mean time of 239 s (4 minutes), while the probability for no activation at time t = 20min is P = 0.96, which satisfies the biophysical constraints C1 and C2 described above. To close the domain Ω more tightly, several considerations can be suggested. The fact that once free/active, Cdc20 needs to find a securin-separase complex and bring it to the APC/C (alternatively find the APC/C first and not get ubiquitylated) might constrain the time somewhat further. We also did not take into account the effective time to get to equilibrium for Cdc20 or the time to clear inhibition of MCC. If the number of MCC is too large, this time cannot be neglected and would provide an explanation for overexpressing inhibitors that prevent anaphase . It would be interesting to account for the dynamics of MCC [26, 36], and how it can influence the transition phase between SAC and anaphase onset [2, 35]. 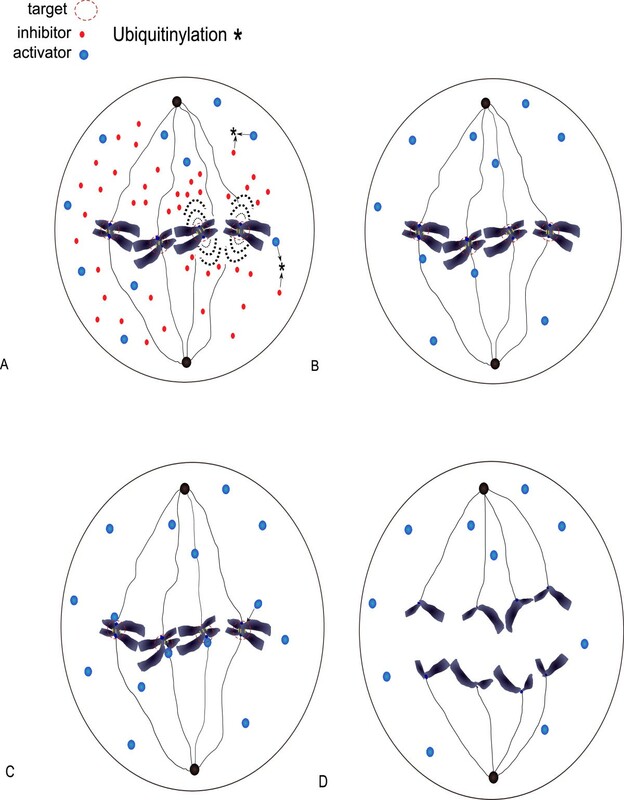 Finally, the present study can be extended to various cell geometry with different size and with different number of chromosomes.